Gibson launched their first electric solidbody guitar, the Les Paul Model, in 1952, into relatively uncharted waters. Colloquially referred to as the Goldtop due to its striking goldcoloured finish, the Les Paul established a new direction in guitar building at Gibson. In terms of spec and decoration, the Goldtop was a relatively unflashy instrument, despite Les’s intent for it to look the part in classy jazz joints. Its simple binding, inlays and hardware certainly placed it well above novice instruments, but the guitar wasn’t on par with Gibson’s stately, high-end hollowbody guitars, such as the Super 400 CES or L-5 CES. Having warmed up the market with the innovative Goldtop in 1952, Gibson elevated its new solidbody line into similar realms of opulence with the Les Paul Custom in 1953. Sporting a multiple bound top and back, an ebony fingerboard, gold-plated hardware and a five-piece split diamond motherof- pearl headstock inlay, comparisons to top-of-the-line guitars like the Super 400 CES were obvious, as the Custom aimed itself at the upper crust of Gibson’s clientele. Solidbodies were full members of the family. Accordingly, in 1954, Gibson finally began to introduce solidbody electrics into their beginner’s market with the Les Paul Junior. However, in order to reflect a significantly lower price, Juniors were built with a much more stripped-down feature set and styling. Gone were the fancy inlays, gold hardware, carved top and binding. The modest slab-body Junior simply made do with one P-90 pickup positioned adjacent to a wraparound bar bridge and along with a volume and tone control was about as simple as an electric guitar could get. Also in 1954, the Les Paul TV appeared. To all intents and purposes, the TV is identical to the Junior, aside from finish; Juniors were initially released in Gibson’s traditional sunburst, while TVs came in a ‘limed mahogany’ finish (a kind of yellowish/light brown colour). The origin of the ‘TV’ moniker has been variously attributed to Les Paul’s famous TV appearances, the finishes on early 50s television cabinets, or Gibson’s belief that a lighter finish would show up better on black and white television – or possibly a combination of the above. The Les Paul Junior name was retained on the headstock until 1963 when, following a formal split with Les Paul, the model became officially known as the SG Jr. The Junior was made using the same high-quality Honduras mahogany and Brazilian rosewood as the higher-end Les Paul models, and was crafted to the same standard on the production line at Gibson’s Kalamazoo factory in Michigan, USA. 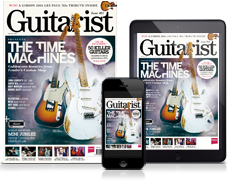 Consequently, they are often thought of as quintessential player’s instruments in terms of delivering great feel and tone without the frills, with many a guitarist preferring their more modest, stripped-back look, too. The Junior underwent major changes in its appearance twice. 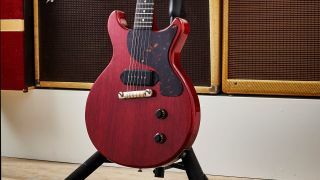 In 1958, it morphed from a single-cutaway body to a double-cutaway design with rounded horns and the standard finish switched from Sunburst to Gibson’s new Cherry Red. A few years later, in 1961, the rounded horn double-cutaway design changed to an SG-style body. The Les Paul Junior name was retained on the headstock until 1963 when, following a formal split with Les Paul, the model became officially known as the SG Jr. Though designed for beginners, the Junior became a player’s favourite over the decades and thus has remained in production, in various guises, on and off ever since.